It has been a while since we took a trip down memory lane and I recreated one of my favorite Marie Callender’s menu items. 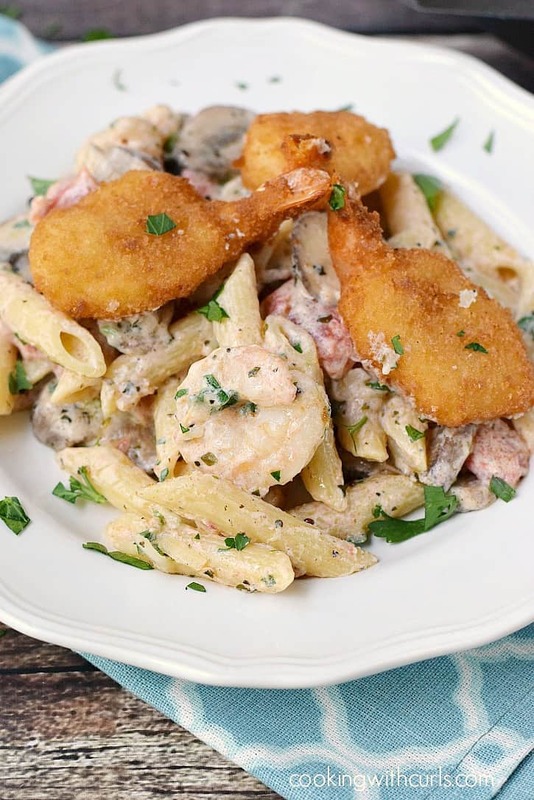 This Double Shrimp Pasta was added to the menu right before I left California, 16 years ago. In fact, it was the last meal that I ate in the restaurant before leaving for Iowa! Needless to say, 16 years is a long time to remember exactly how it tasted….. 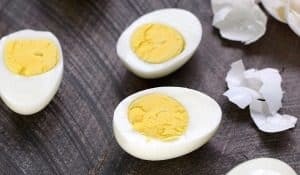 I remembered that it had cream cheese, so I started throwing ingredients into my cart and came home to give it a try…..and it turned out even better than I remembered!! Preheat oven and bake the breaded shrimp according to the package instructions. 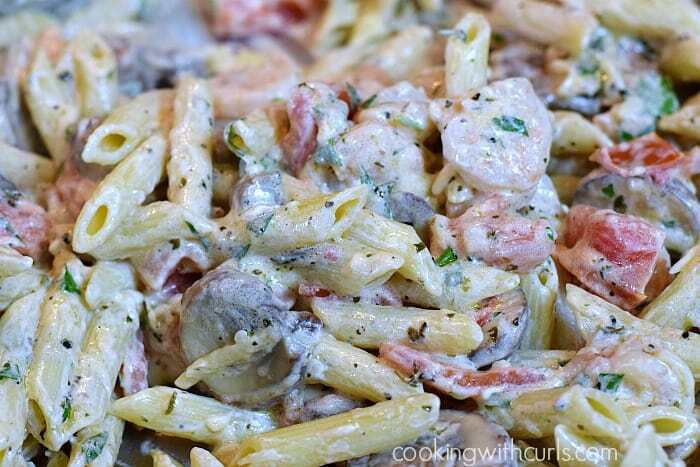 Cook the penne according to the package directions and reserve 3/4 cup of pasta water for later. 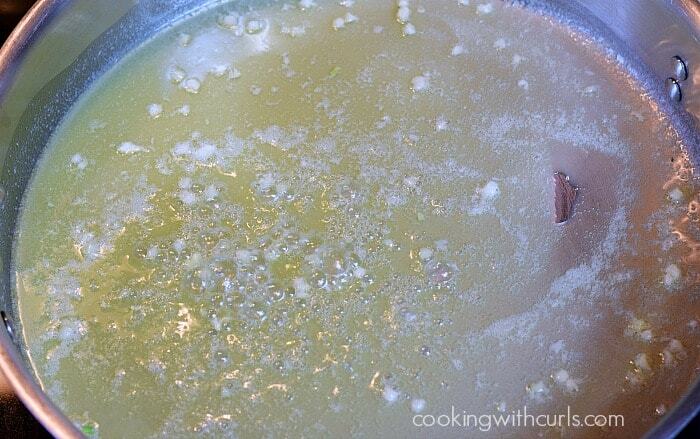 Heat oil and melt the butter in a large skillet over medium heat. Add the garlic, stir and cook for one minute…..
Do not burn the garlic, it will make it bitter. 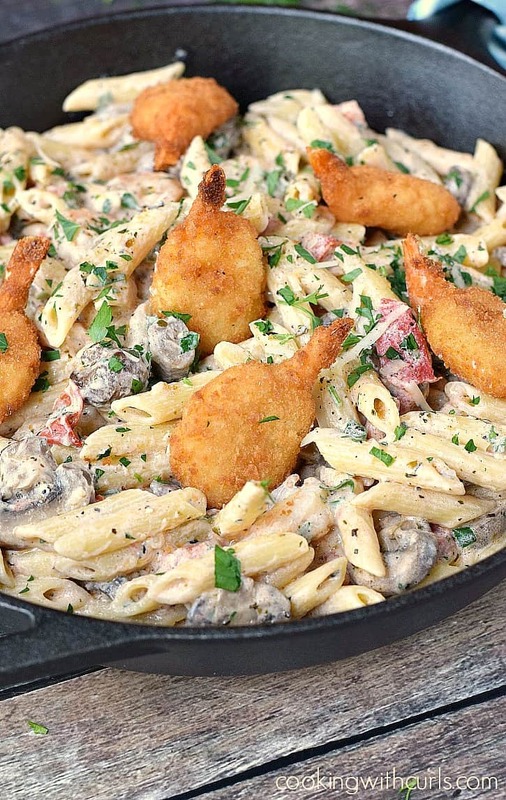 🙂 Add the mushrooms, basil, oregano and cook for 3 minutes to soften…..
Add the tomatoes and shrimp, cook until shrimp is pink and thoroughly cooked…..
Stir in the cream cheese and cook until melted…..
Add cooked pasta and enough reserved hot pasta water to thin sauce to desired consistency…..
Stir in the grated cheeses and Italian parsley. Season with salt and pepper to taste….. 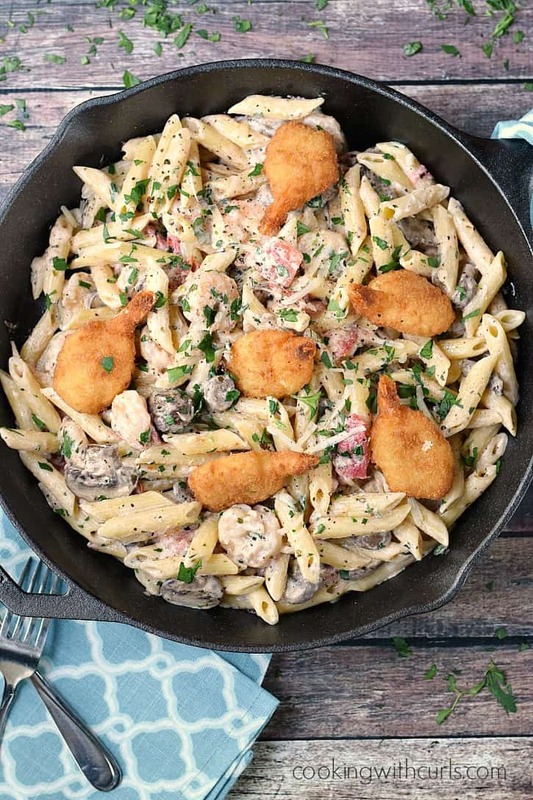 Serve pasta topped with breaded shrimp….. 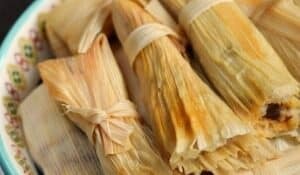 I have a tendency to lose track of time while I am cooking…..which makes it hard to gauge how long a recipe actually takes. Sorry, it’s true! 😉 I can tell you that I made this meal, took the photos, and sat down to eat in 45 minutes! 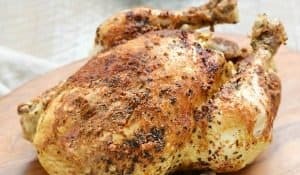 So this restaurant quality meal should be ready in 30 minutes, give or take a few minutes. Now that is my kind of meal!! 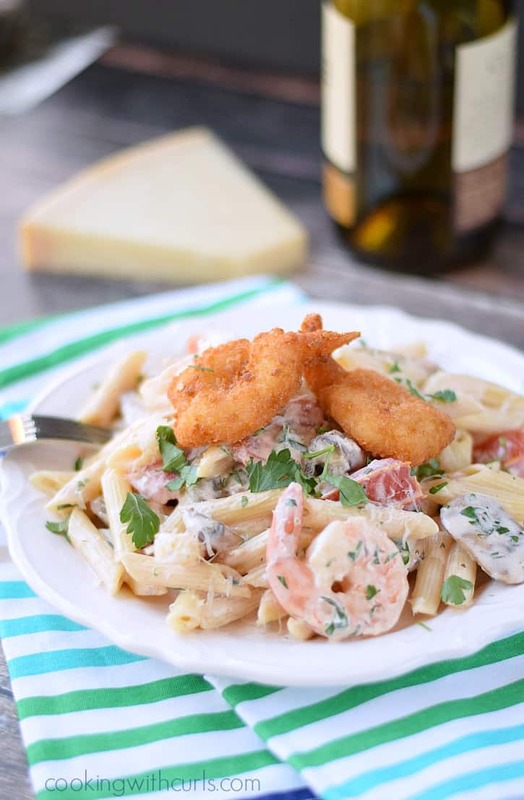 This Double Shrimp Pasta is a restaurant quality meal that is incredibly easy to make at home in about 30 minutes! Preheat oven and bake frozen, breaded shrimp according to package directions. Heat oil and melt butter in a large skillet over medium heat. Add the garlic, stir and cook for one minute. 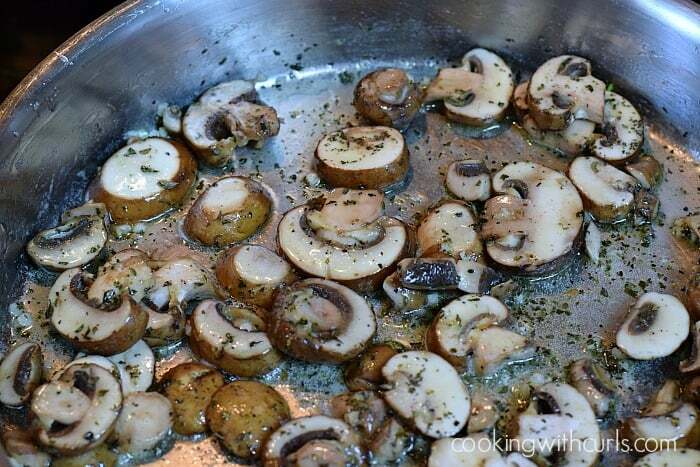 Add the sliced mushrooms, basil, oregano, stir and cook for 3 minutes to soften. 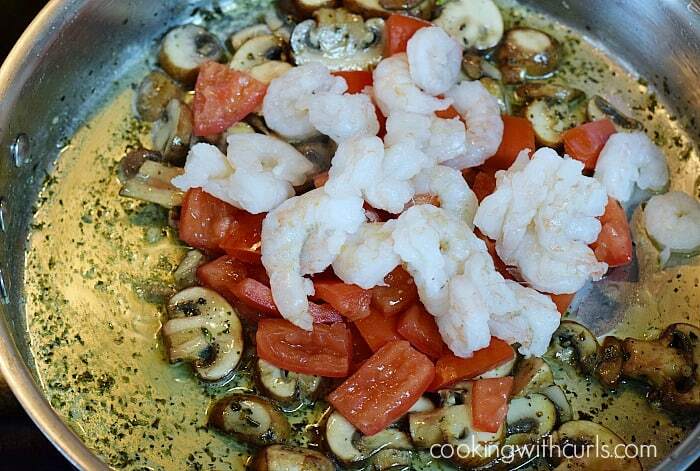 Add the tomatoes and shrimp. Stir and cook until shrimp is pink. 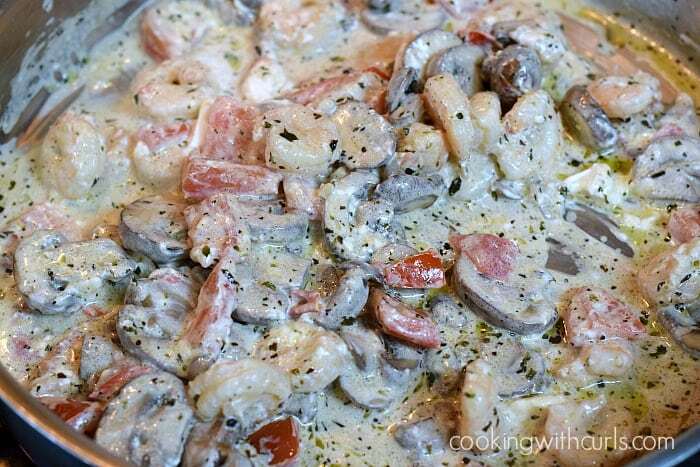 Stir in the cream cheese and cook until melted. Add cooked pasta and enough reserved hot pasta water to thin sauce to desired consistency. 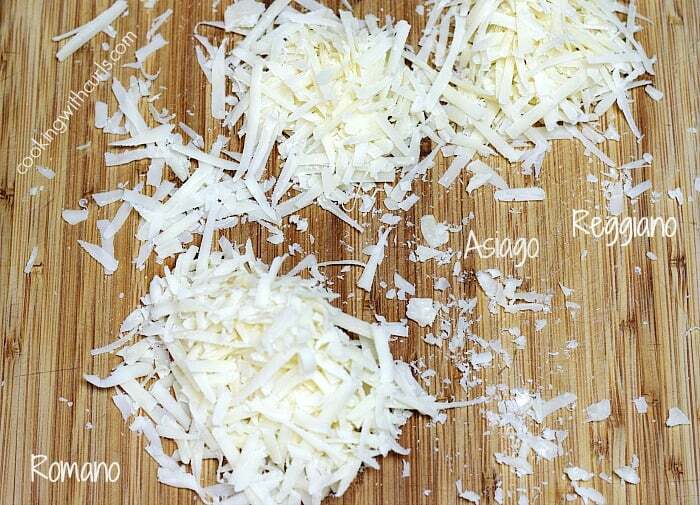 Stir in the cheeses and Italian parsley. Season with salt and pepper to taste. 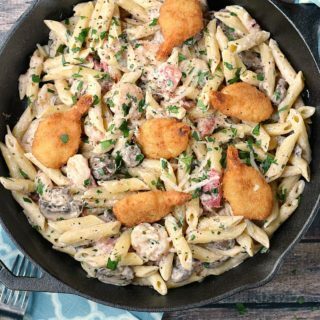 Serve pasta topped with breaded shrimp. Wow – that looks so good Lisa!!! Pinned!